Part III of "What's the Matter with Seattle?" In this series, we examine a theory raised by The Wharton School’s Prof. Barbara Kahn that, for whatever reason, Seattle’s retailers just get customer experience. Today, we go on an adventure to REI. Read Part I: Amazon Go and Part II: Amazon Books. 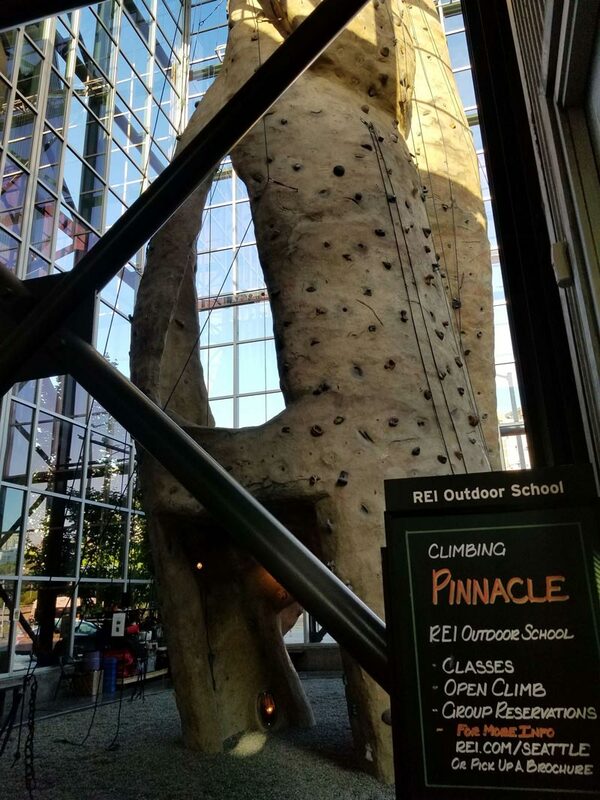 Nestled at the edge of downtown like a small mountain, the REI flagship soars over its immediate neighbors (except I-5), with a full-scale climbing wall visible through the glass. Walk around the corner to the main entrance and you’re suddenly surrounded by pine trees and a warning sign that the dirt path next to you leads to a mountain bike testing area. You come to an overlook. Flanking you are displays showcasing favorite Washington trails. Down below, a waterfall greets customers who parked in the subterranean garage. I paused for a moment and drew it all in. A family approached. “This is the coolest REI in the world,” one said. “It’s REI heaven,” her sister exclaimed. They hadn’t made it to the front doors yet. Upon entry, you’re greeted by a relatively fashionable campsite. Your natural footpath carries you right into the yurt, where you see what life could be like (after purchase). Drop your backpack down by the campstove, plop down in your chair, kick your feet up on the table, and resume your book about craft beers of the Pacific Northwest. All along, the only thing missing was you. Emerging from the shelter, one finds the climbing wall directly ahead. A trainer was busy coaching a pair of beginners, who cautiously began climbing the mountain located at Eastlake Ave. and Stewart St. I went back to thumbing through my book. Looking up, I noticed small paper booklets on the wooden table, subtly advertising REI’s travel business. 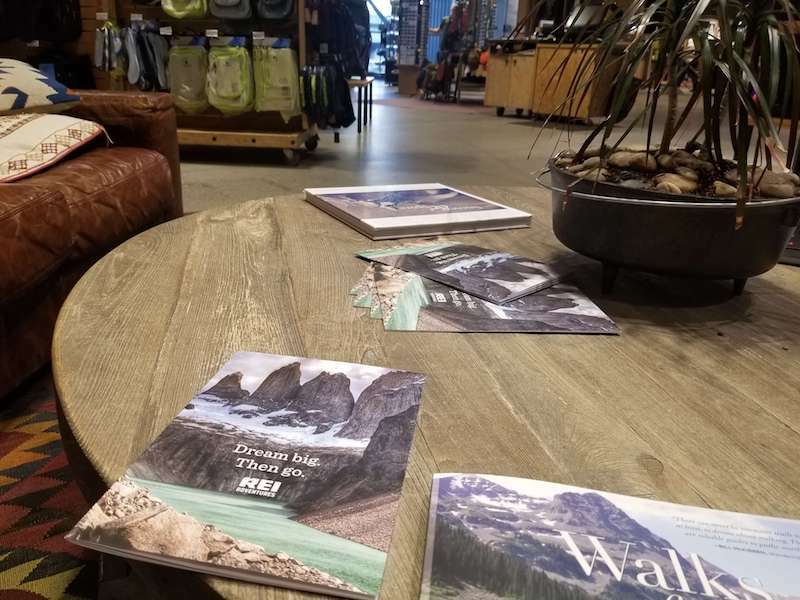 Over my shoulder, I saw a wall of one-pagers, each showcasing a different adventure I could take with REI. I tore off the one for kayaking in Croatia, then another where I could sojourn from Chiang Mai to the River Kwai. I put them in my pocket and continued on my more immediate exploration. Upstairs, small groups of people tried on hiking boots. 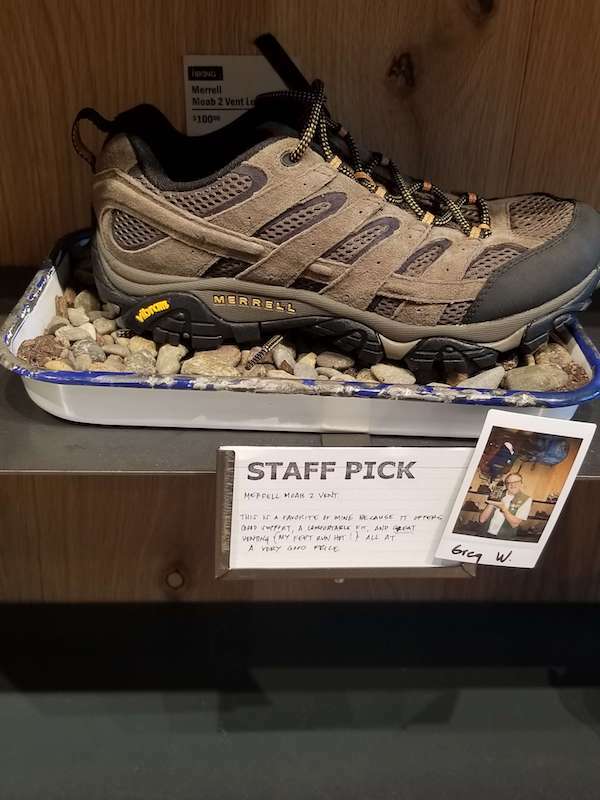 They sat on standard-issue stools, but there were small boulders next to them, intentionally placed there so customers can test the grip on their possibly new-favorite shoe. The staff’s favorites, meanwhile, were flagged on the display wall. In notes meant to look handwritten, polaroid-framed associates explained how they liked the balance of price and performance for one, or the proven durability under tough conditions for another. 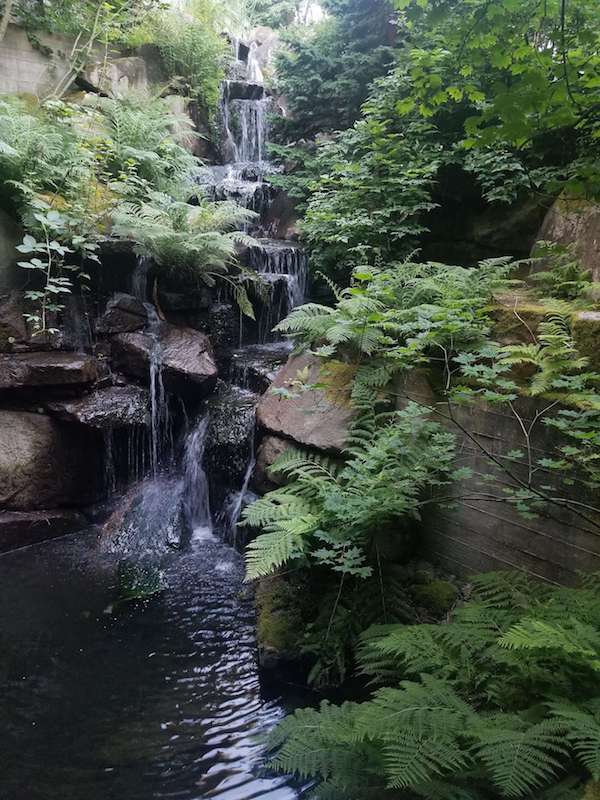 I went out the doors and ventured down to the miniature-waterfall, just to see it up close. A few moments of babbling water added to the serenity and then, like Moonlight Graham walking out of the cornfield, across the baseline, and into the present day, I stepped back into Seattle’s concrete jungle. Continue to Part IV: Starbucks Reserve Roastery.